One Hundred Fifty Four Years Ago Today. One hundred and fifty four years ago today, April 14, 1865, President Abraham Lincoln was shot and killed by John Wilkes Booth at Ford’s Theater. Lincoln was attending the play “Our American Cousin” with his wife and guests Major Henry Rathbone and his fiancée Clara Harris, daughter of New York Senator Ira Harris when shortly after 10 PM, Booth entered the Presidential box and shot Lincoln in the head with a .44-caliber pistol made by Henry Deringer of Philadelphia. Major Rathbone rushed Booth and was stabbed with a knife Booth was carrying. Booth then jumped to the stage below the box and allegedly caught his spur on the bunting and American flag on the front of the box which caused him to break his left leg. At some point in the assassination, Booth was heard to shout “Sic Semper Tyrannis!” (“Thus Always to Tyrants”) which is the Virginia state motto. While Booth escaped across the bridges of Washington, past sentries and pickets, and into Virginia, Lincoln was attended to by 23-year-old Army captain named Charles A. Leale, who had just received his medical certificate six weeks earlier. While examining Lincoln’s head, Leale’s fingers passed over a “large firm clot of blood situated about one inch below the superior curved line of the occipital bone” (at the rear base of the skull). The young physician removed the clot, wiggled his little finger into the hole made by the “ball” (the name for the round bullets then in use in the 1860s), and found that it had made its way into the brain. This maneuver may seem shocking to a 21st century observer but in the days before doctors knew anything about microbiology, let alone sterile surgical technique, it was a common practice for examining gunshot wounds. Dr. Leale quickly determined that this was a mortal wound. 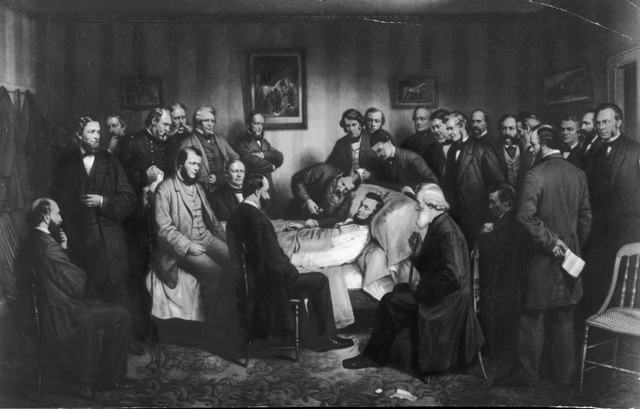 After a few minutes, Lincoln’s breathing seemed to rally a bit and Dr. Leale was able to get a bit of the brandy and water down the president’s mouth. By this time, two other doctors, C.F. Taft and A.F.A. King arrived to the scene and the three of them decided to move the moribund president across the street to William and Anna Petersen’s boarding house, at 453 10th St. (now 516 10th St.) There, he was taken upstairs to rest in the room of a Union soldier named William T. Clark, who was out for the evening. Leale had attended the highly respected medical school in Belleview, NY, but was missing something that night – experience. Leale had no or at the most, limited experience in dealing with head wounds from a bullet. In a Civil War where there were no such things as helmets, head wounds such as Lincoln’s were common. It was also common that the men who had those wounds survived. Leale did not have the battlefield experience to know what to do or how to treat Lincoln’s wound. It is speculated that by putting his finger into Lincoln’s head and moving it around, Leale may have made the situation worse. Once at the Peterson House, other doctors – without battlefield experience – probed and prodded at the head wound, digging around with metal instruments trying to get the bullet out. Their actions too may have made the Lincoln situation worse. (Of course, we’ll never know if that is the case, but it adds another layer of intrigue to the assassination. Even the trip to the Peterson House was not without drama. Crowds had already started to form outside the theater and just getting Lincoln through the masses was not easy. Due to Lincoln’s height, there were problems getting him into the house and up the stairs with witnesses reporting that Lincoln was hit against the railing and walls of the home. The bedroom in which Lincoln was placed was not the best situation either. Because of Lincoln’s height, the foot of the bed frame was removed and Lincoln was laid diagonally across the mattress. At 7:22 AM on April 15, 1865, less than a week after General Robert E. Lee’s surrender of the Army of Northern Virginia to General Grant at Appomattox Court House which effectively ended the war, Lincoln was dead. Secretary of War Edwin M. Stanton is claimed to have said “now he belongs to the ages,” but some present say Stanton said “now he belongs to the angels.” This is another controversy in a episode full of witnesses that it seems couldn’t agree on critical details. Lincoln was 56 years old. Lincoln himself is both pilloried and exalted. He was forced to make choices that were very difficult and from which others had walked away. (For example, Lincoln’s predecessor, James Buchanan, had left the question of what to do with the South for Lincoln to handle. Buchanan had chosen not to resupply Fort Sumter leaving the garrison hungry and open to the bombing that started the Civil War.) Lincoln violated the civil rights of journalists in the state of Maryland and stopped the legislature from meeting in order to prevent them from voting to join the South. Lincoln, it is said, expanded the powers and authority of the Federal government which didn’t make many people happy. Lincoln’s enforcement of the draft was not popular in many states as well. On the other hand, Lincoln recognized that the United States needed to stay as the United States. Can anyone imagine wanting to go to Pennsylvania and having to get a passport to do it? Can anyone say that the passage of the 13th Amendment was not the right, best and moral course for this country? Lincoln was not only a brilliant lawyer (something that he is not given much credit for) he also had the ability to take people that disliked him and put them in positions if they were in his mind, the best for the job. Unlike today it seems, Lincoln was more interested in results rather than politics. That is not to say that he was not mindful of politics, but rather he seemed to want to put the country ahead of the bickering of people and parties. 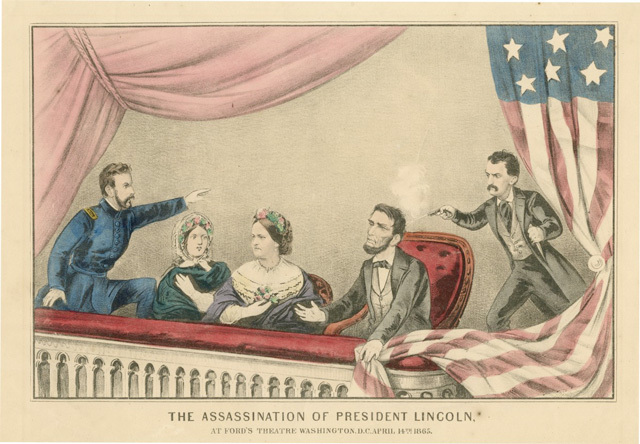 The assassination of Lincoln in some warped way, served to unite the country. People of the South who hated Lincoln as President saw his death as a tragedy and feared the repercussions from the North. Lincoln’s mild policies for reconstruction were assailed by many in the North prior to his death, but many of those polices were implemented for the good of the country in honor of Lincoln. Still, the assassination of Lincoln to this day is a study in incredible events. For example, Booth and his conspirators originally planned to kidnap Lincoln weeks before. On March 17, 1865, Booth and his fellow conspirators hid along a country road in Washington, D.C., intending to commandeer the presidential carriage that was scheduled to carry Lincoln to a matinee performance of a play at Campbell Hospital to benefit wounded soldiers. Lincoln, however, had a change of plans and never showed. General Ulysses S. Grant and his wife Julia were to attend the performance of “Our American Cousin” with Lincoln on April 14, 1865. However, Lincoln’s wife had insulted Julia Grant and the Grants decided to go to New Jersey to visit their children rather than attend the play at Ford’s Theater. Grant, instead of Rathbone, could have been seated next to Lincoln that night. No one in the Presidential box that night lived what anyone would consider a “normal” life. Abraham Lincoln was of course, dead. His wife, Mary Todd Lincoln became so disconsolate and mentally unstable that her own son, Robert Todd Lincoln, had her committed and institutionalized. Major Rathbone married Clara Harris and in what some people think may have been a case of post traumatic stress disorder (PTSD,) became increasingly erratic in his behavior. Shortly before Christmas in 1883, Rathbone shot and stabbed his wife to death and then stabbed himself in an attempted suicide. He failed in the suicide attempt, and spend the remaining three decades of his life in an institution for the criminally insane. Even Ford’s Theater did not escape unscathed. When John T. Ford attempted to reopen Ford’s Theater to performances on July 10, 1865, Stanton, who was “opposed to its ever being again used as a place of public amusement,” dispatched heavily armed soldiers to prevent the show from going on. The federal government eventually purchased Ford’s Theatre for $100,000, gutted the auditorium and converted the building into war department offices. On June 9, 1893, at the precise moment when funeral services for Edwin Booth [who was John Wilkes Booth’s older brother and more popular actor before Booth killed Lincoln] began inside New York’s Church of the Transfiguration, three floors of Ford’s Theatre collapsed into the basement and killed 22 federal workers. It is fair to say that prior to the United States Civil War, the US as a country was fairly “innocent.” We bickered amongst ourselves as all family members do, but there was still the sense that we were Americans. That innocence ended with the Civil War. No one – and we mean no one – could imagine the horrors and devastation the war would bring to the nation, to states, to the battlefields, to homes and to families. Somehow that devastation and the accompanying tragedy is summed up in the assassination of President Abraham Lincoln – an assassination that took place 154 years ago today.